I won’t lie – this might stink up your house just a tad, but it will be totally worth it! 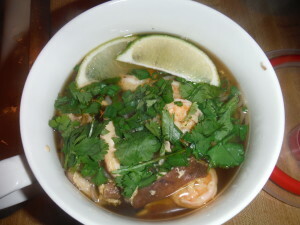 First, gather your ingredients: shrimp, chicken stock, fish sauce, fresh ginger (that dried ginger is nasty and tastes nothing like the real thing), fresh garlic, shirataki noodles, shiitake mushrooms, green onions, cilantro, eggs, S & P, lime wedges, and sriracha (if you’re feeling dangerous). Start by preparing the shrimp. 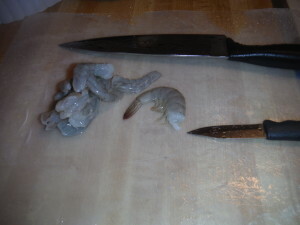 I always use fresh shrimp because the frozen ones never quite cook the same way. They always get rubbery and shriveled no matter how little you cook them. After rinsing off the gunk and yuck, peel and devein the shrimp. 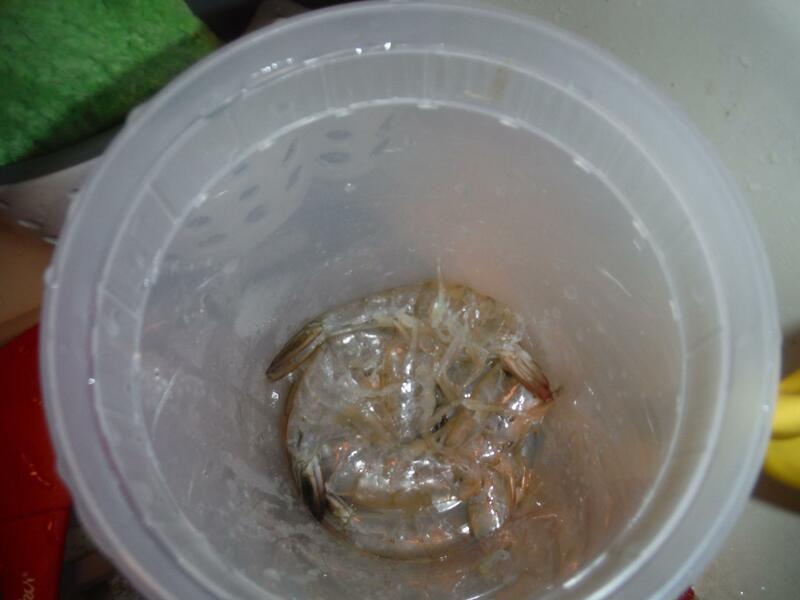 This is slightly time-consuming, but wouldn’t you rather eat shrimp without their digestive track? 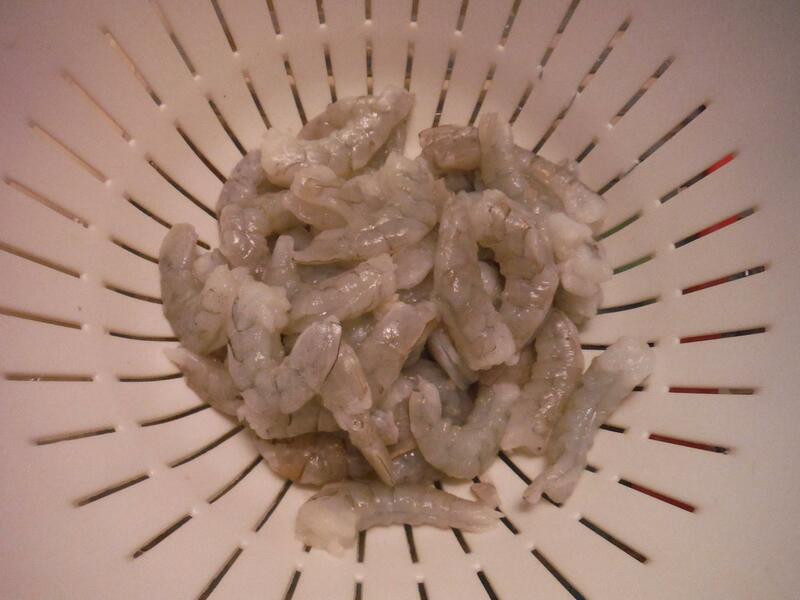 Rinse the shrimp again, to you know – get rid of any additional traces of ickiness. Also, save those shells! 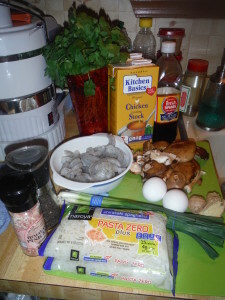 They make a lovely shrimp stock and I will show you how to make it next week! 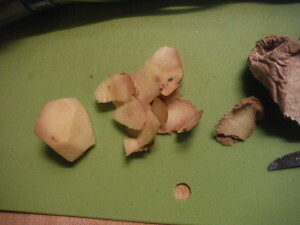 Peel the fresh ginger and rinse off any dirt. It’s so important to use fresh ginger instead of dried because there is a huge taste difference. To me, ground ginger tastes horrifying and pungent and will definitely ruin anything it comes into contact with. Just me? Fine. But if you don’t have a particular predilection for either, just go with the fresh. You’ll thank me later. 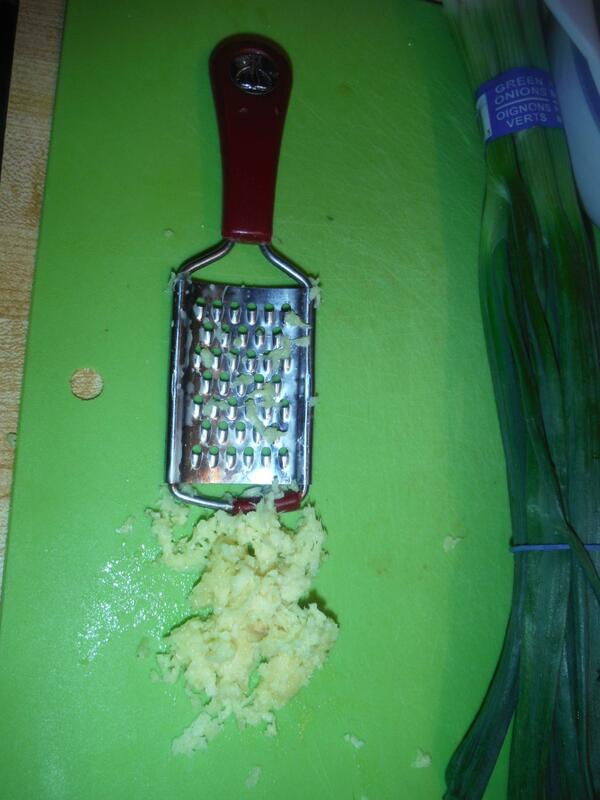 Grate the ginger. 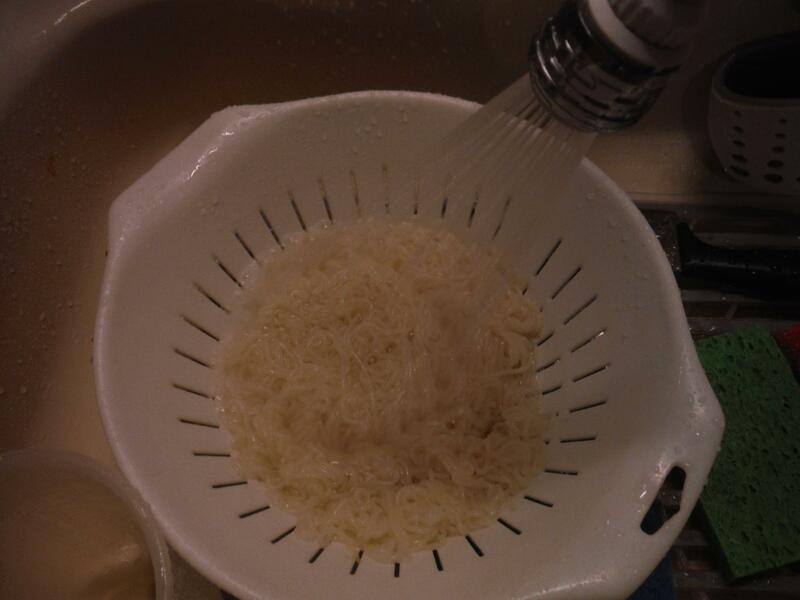 Open up the shirataki noodles and give them a good rinse. For some reason, these stink horribly when you first open them. If you don’t bathe them well enough, they will keep a strange stinky taste even after cooking. 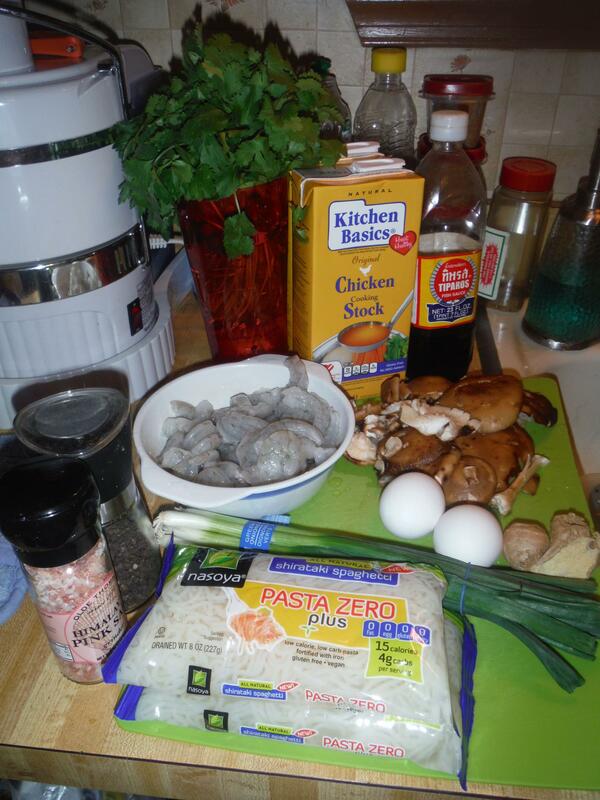 Add the ginger, fish sauce, and garlic to the chicken stock and bring to a boil. Once boiling, add the shirataki noodles and cook for 4-5 minutes. 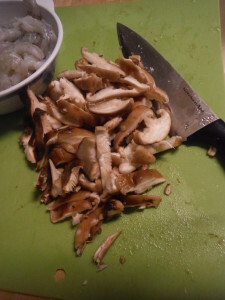 Clean and slice the shiitake mushroom. 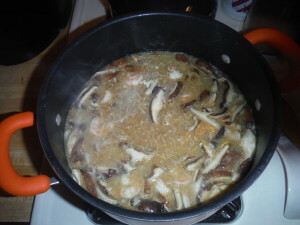 Add mushrooms, eggs, and shrimp to the pot and cook for 3-4 minutes more. If you want the soup to be more egg drop soup-y, create a cyclone with a spoon and drop the eggs in little by little as the soup swirls. You don’t have to do this, but why wouldn’t you want to make a ramen-y whirl pool? Serve with cilantro, green onions, and lime wedges. Add some sriracha if you think you can handle it. 😉 Enjoy! Thanks for stopping by and have an Aloha filled day! Prepare your shrimp. Peel and devein shrimp. Set aside. Place chicken stock in a large saucepan over medium-high heat. Add the grated ginger, fish sauce, and garlic. Bring to a boil. 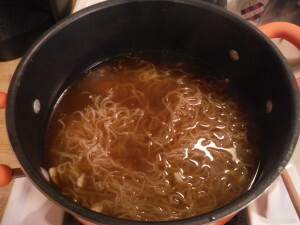 Rinse off the shirataki noodles well - or they will taste gross - and add to the broth. Cook for 4-5 minutes. Add mushrooms and eggs to the pot and boil for 4-5 minutes more. To make the soup more egg drop-ish, swirl the liquid with a spoon and drop the eggs in little by little. 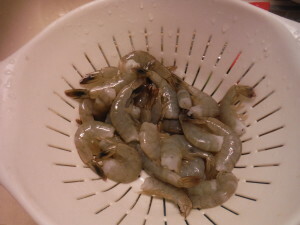 Add the shrimp and let cook for 3-4 minutes more, or until shrimp are pink. S & P to taste. Serve topped with green onion, cilantro, and lime wedges. Top it off with some sriracha, if you're feeling dangerous. « Monday Morning Affirmations – Because it feels good.